My lovely wife and I shared a victory toast and a kiss in front of the fireplace in the lobby of the hotel that we are staying in Colorado, upon the announcement that the GOP won the Senate. Our Conservative Campaign Committee team has been here for weeks working to elect Cory Gardner for U.S. Senate. Gardner won! 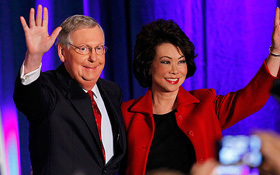 Folks, please do not get me wrong: I am elated that the GOP has won control of the Senate. Despite their faults, the GOP is closest to our principles and values. Also, we desperately needed to dethrone evil madmen Harry Reid as Senate Majority Leader. However, I must confess that it was annoying to watch Karl Rove on TV pounding his chest in victory about how he and his group pushed the Tea Party nut candidates out of the race. Rove had the nerve to say he and his people wanted the best electable conservative candidates. That simply is not true. Chris McDaniel, to name one, in Mississippi was an awesome extremely electable Tea Party conservative who was pushed out of the race with GOP dirty tricks which included race-baiting. Yes, you heard me correctly. The GOP establishment machine engaged in the Democrat-gutter, tried and true, despicable tactic of race-baiting to screw McDaniel. I know. I know. You're saying, C'mon, Lloyd, that's in the past. We won. Celebrate and get over it. Sorry, folks. I expect better from our side. Rove and his deep-pocketed homey's strategy of the GOP keeping a low profile and letting Obama hang himself worked okay. Unfortunately, exit polling revealed that the GOP is still viewed unfavorably by a majority of voters. http://politi.co/1uvBqsN Given the horrors and scandals of the Obama regime, the Republican wave should have been a tsunami. What if the GOP had offered an agenda inspiring people to vote FOR them rather than AGAINST Obama? What if the GOP boldly articulated why conservatism is the best and most direct path for each and every American to achieve their American dream? Two remarkable things happen this election that strongly suggest that blacks are open to hearing what Conservatism has to offer over Liberalism. A video of urban blacks in Chicago trashing Obama and the Democrats went viral. http://bit.ly/1vaWFdZ My lifelong Democrat 86 year old black dad called from Maryland to tell me that he did not like any of the candidates, but voted Republican. Folks, that is huge. Dad has always believed that a vote for a Republican is a vote for the KKK. So something is up. Republicans now control the House and the Senate. Praise God! Now what? Word on the political street is the GOP plans to give the Tea Party the finger. Patriots, we must be more mobilized and engaged than ever. We must do everything in our power to push the GOP into doing what we worked our butts off for them to do: Stop Obama's Agenda! D.C. insiders say that the GOP strategy is not to push back too soon or too hard against Obama's agenda as not to be called arrogant, aggressive and mean by the MSM. The game plan is to play nice with Obama as not to hinder our chances of winning the White House in 2016. These D.C. insiders also say repealing Obamacare is impossible and the best that we in the Tea Party can hope for is for the GOP to fix it. Mitt Romney said upon the GOP winning the Senate an immigration bill would be top priority. http://usat.ly/13JeTgr You see where this is headed folks? The GOP plans to go swishy on us and implement a Democrat-lite agenda. We can not and will not allow them to get away with it. I am proposing that the united forces of the Tea Party launch "Operation Hold Their Feet to the Fire." Every individual, group and organization must use their gifts, talents, skills and passion to force the GOP to do the right thing. Folks, we have brilliant minds on our side. I have met many of you traveling on over a dozen national bus tours, attending over 400 tea party rallies. I challenge you to think of strategic ways to turn the GOP's agenda to our agenda; repeal Obamacare, secure our borders, fiscal responsibility, restoring our freedom and liberty and turn us back to one nation under God. Ronald Reagan: "There is no limit to the amount of good you can do if you don't care who gets the credit." Patriots, I am calling for an all hands on deck drill to save our country by holding the Republicans' feet to the fire. Frankly, I do not care which Tea Party group, organization or individual that leads the charge. Let's just get it done! Everyone pulling together is how we (Conservatives) won big in 2010, shocking Washington D.C., despite being ignored by the MSM. As I said, we are in Colorado, too busy campaigning to enjoy the world renowned hot springs. In celebration of the Republican wave, America's push back against socialism, we can relax a bit. Mary and I plan to enjoy a few relaxing therapeutic soaks in the sulfur smelling hot springs. Then, we will be ready to pack our bags and hit the road on a "Hold Their Feet to the Fire Tour." I have even written a soon to be released theme song. I thank God for our victory. But, there is still much more work to be done; miles to go before we sleep. Congrats patriots, taking the U.S. Senate is a major step in the right direction.